Of all the restaurant tours, why this one? Since when is Germany a centre for cooking excellence? Well, ever since German TV chefs like Alfons Schuhbeck and Frank Oehler replaced pork knuckles, sauerkraut and curried sausages with Michelin Star menus that blend aromatic opulence and creative finesse with meticulous Vorsprung durch Technik. This unique culinary adventure will take you to three unique destinations within the heart of the country’s most beautiful landscapes - Munich, Stuttgart and the charming Black Forest town of Baiersbronn, and you’ll be staying in five-star luxury accommodation all the way. Sounds Wunderbar! What else can I expect? 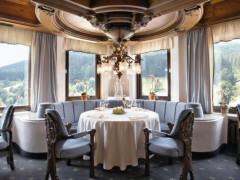 You’ll dine in two of the world’s most renowned restaurants; 11 table Schwartzwaldstube and 8 table Bareiss, each with three Michelin Stars. You’ll visit Christmas Markets, discover the enchanting city of Stuttgart, experience charming Bavarian villages and go on guided Black Forest adventures. In a nutshell, it will be like the Twelve Days of Christmas, only with more Michelin Stars and fewer drummers and partridges. Click the link to see the full, tantalising 7-day itinerary. Eat some of the best food in Europe! 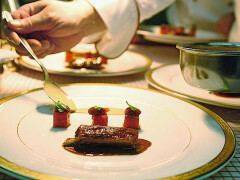 84 Michelin Stars in total to be German and exact about things! Not one Currywurst in sight!